We are growing so fast that even having three different worship services on Sunday is barely enough to accommodate all of our parishioners. It's time to build a bigger church! To meet our financial goals, we've published a beautiful hardback cookbook with full color cover and dividers featuring over 300 of the best recipes from families and friends of the St. John Vianney Latin Mass Community in Maple Hill, KS. Cookbooks will be sold at the promotional rate of just $10 for a limited time. This price includes FREE shipping anywhere in the US. Grab one for yourself or as a gift! Buying locally? 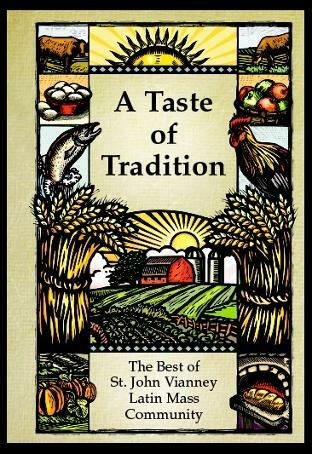 Click here to order a copy and pick up your cookbook at St John Vianney parish. Use the menu above to learn more about A Taste of Tradition and view sample recipes. Regular price is $9.00 plus $3.00 postage and handling. 1. Click Add to Cart and proceed with checkout through Paypal. If you'd like more than 1 cookbook, change the quantity to the desired number and click Update. 2. You may click View Cart to see your order at any time. 3. If paying by cash, check or money order, please click on the Contact tab above for instructions. 4. Cookbooks can be shipped to you or a gift recipient! Just let us know in the "Notes" portion of your Paypal transaction. All cookbook proceeds go towards our parish building fund. Buy a cookbook.....build a Church! Thank you for your purchase and may God bless you!